Dr. Joseph Holt enjoys a wide-ranging musical career as conductor, pianist, chamber music performer, arts administrator, educator and arranger. 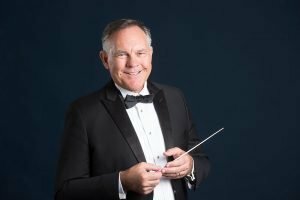 In 2018/19 he will celebrate his tenth anniversary as Artistic Director for the Choral Artists of Sarasota, Sarasota’s professional choral ensemble. Under his leadership, the ensemble has garnered numerous accolades for its innovative programming and superior vocal quality. With Choral Artists, he has brought to Sarasota Too Hot to Handel, the Jazz and Gospel version of Handel’s Messiah and a stunning presentation of Carmina Burana in collaboration with Leymis Bolaños Wilmott and Sarasota Contemporary Dance. He is also Artistic Director of the Artist Series Concerts of Sarasota, Music Director at Faith Lutheran Church and co-host for Music Mondays with Ed Alley and Bob Sherman. For the Artist Series, Holt has designed innovative programs including performances at the Sarasota Opera House for five pianists performing on five concert grand pianos. In October, 2017, Dr. Holt was recognized by the Arts Alliance of Sarasota for Artistic Achievement. During the summer of 2011, he recruited and rehearsed a chorus comprised of singers from southwest Florida for a program commemorating the tenth anniversary of 9/11. He made his conducting debut with the Sarasota Orchestra during these concerts at the Van Wezel Performing Arts Hall. 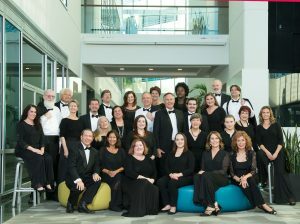 With Gloria Musicae (now Choral Artists of Sarasota), he premiered the newly revised critical edition of Petite Messe Solennelle by Gioachino Rossini at the Sarasota Opera House in April, 2010; the Florida premieres of Such Was the War by James Grant in 2012; Gettysburg Address by Alan Gershwin in 2013; and Voices of the Holocaust by Sheridan Seyfried in 2014 at the Van Wezel Performing Arts Hall. Under the direction of Dr. Holt, Gloria Musicae was invited to perform at the Amalfi Coast Music and Arts Festival in the summer of 2012 where the ensemble presented an all-American program featuring the European premiere of The Midnight Ride of Paul Revere by René Clausen. 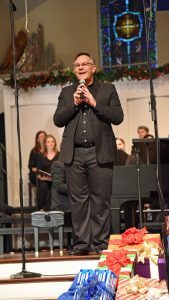 He also served as Interim Artistic Director for the acclaimed Master Chorale of Tampa Bay in the spring of 2010, preparing Elijah for performances with The Florida Orchestra and presenting an all-Broadway concert in Tampa and St. Petersburg. He also presented performances with the Master Chorale in the Fall of 2016. Dr. Holt served more than twenty years as principal pianist with The United States Army Chorus in Washington, DC, performing for US Presidents, dignitaries from around the world and military officials. He also held the position of Associate Music Director for The Choral Arts Society of Washington for fifteen years. 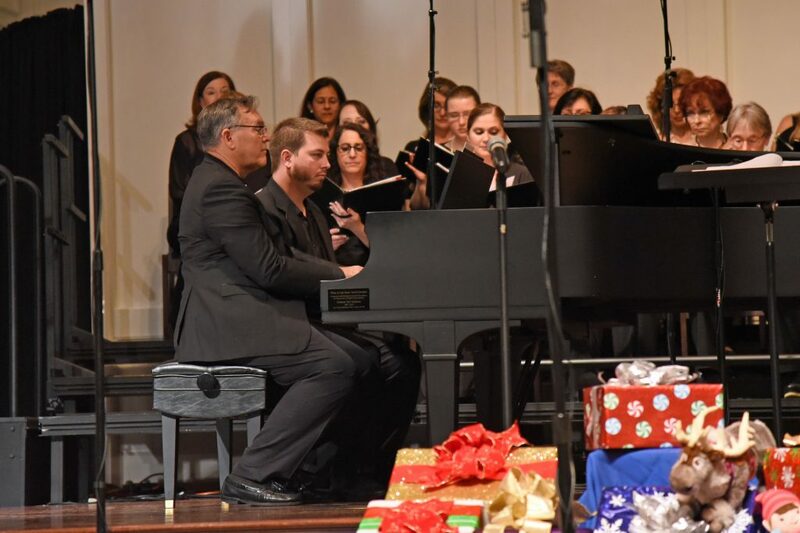 During his tenure with the Choral Arts Society, he conducted Singers For All Seasons, a community outreach ensemble, and successfully led the organization in the highly popular Family Christmas Concerts at the Kennedy Center. Dr. Holt made his Choral Arts conducting debut with Ariel Ramírez’s Misa Criolla during the 2002/2003 season. Misa Criolla was subsequently recorded with Navidad Nuestra by Ramírez and Missa Luba on the NAXOS label and released internationally to critical acclaim. This recording was awarded the 2006 Washington Area Music Award for Best Classical Recording. With Choral Arts, he has also conducted a performance at the Chester Summer Music Festival during the Society’s tour of England in the summer of 2002; conducted a performance of Gershwin’s Porgy and Bess in the Kennedy Center Concert Hall; and conducted two programs at the National Presbyterian Church including the North American premiere of John Tavener’s Lament for Jerusalem and the world premiere of Missa pro Pace by Kentaro Sato. In July of 2000, he was one of 10 conductors who prepared a chorus of 2000 voices for the world premiere of Maury Yeston’s Cantata 2000 in a performance by the National Symphony Orchestra, Leonard Slatkin conducting, at the Lincoln Memorial. He produced a series of multi piano concerts for The US Army Band featuring ten pianists and five concert grand pianos and performed with the Band and Chorus throughout the United States. His recordings include Rhapsody in Blue with The US Army Band, music from The Holocaust Museum on Albany and Transcontinental, accompanying soprano Janice Chandler on The Choral Arts Society Christmas CD, and accompanying The United States Army Chorus in concert. As a pianist he has been awarded numerous prizes, including the Brahms award from Wolf Trap, and his appearances in recital and with orchestras in North America, Europe, and the Middle East have elicited acclaim from audiences and critics alike. In the Washington area he has performed at The National Gallery of Art, the Phillips Collection, the Organization of American States, and the Holocaust Museum, among others. Unusual highlights of his musical career include coordinating and conducting the Filene Center Orchestra for a gala performance featuring premier comedian Victor Borge at Wolf Trap, compiling and directing the music for Prodigy, a children’s play about Mozart at the Kennedy Center, performing with soprano Jessye Norman at the base of the Hoover Dam, and assisting in the development of the National Music Conservatory in Amman, Jordan. He holds degrees from the Eastman School of Music, Shenandoah Conservatory and the Catholic University of America.